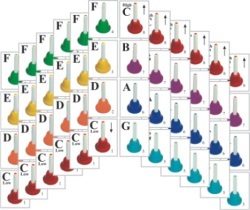 Appropriate for preschool through early elementary, this handy card set is printed to match the RB108 handbells and RB109 deskbells. You'll get 96 cards (12 of each note) with the a photo of the bell, the note name, and note number printed on the card. By preparing a stack of cards in advance, you'll be able to direct simple melodies by turning through the cards in sequence. You'll be amazed at how such young children can play a melody using these cards! Many of the melodies in the RB7014 and RB7015 books are playable using this set of cards. Cards are printed on heavy card stock and measure 4.25" by 5.5".